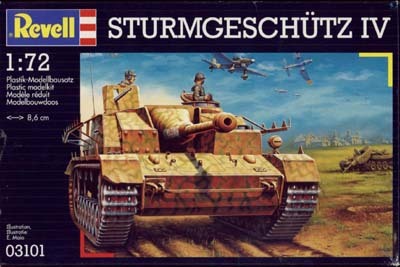 I am not going to give a complete history of the StuG IV. Interested readers can find them in [1,2,5,11], but I'll just give a very brief summary of what is an early or late StuG IV. This is already quite complicated as the superstructure evolved with the StuG III and the chassis with the Pz.KpfW. IV.  Added frontal armour. Field mods were bolted, others welded.  August '44 (partially): hinged, sloped armour over frontal plate, concrete armour over driver's position.  December '44: extended hull sides with integral tow holes.  Laterally opening hatches for the loader. It represents an early vehicle with 4 return rollers, horizontal muffler and old loader's hatches. According to  it scales out to 1/70.2 in length and width, but the superstructure is far too low.  A StuG IV is a low vehicle, but not this low ! 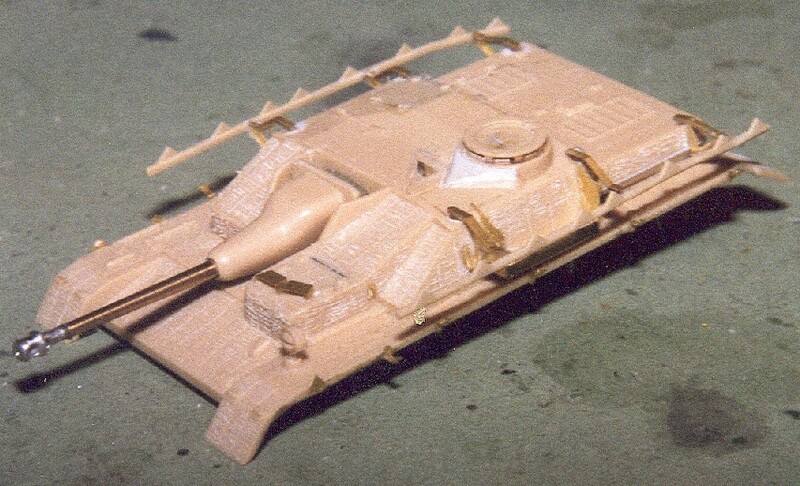 It is almost impossible to rectify, unless you graft a better StuG III superstructure on to it. I left it as such.  The barrel is far too fat. I replaced it with MicroRealistixx 72102 7.5 cm KWK L/48 (Pz IV). Still, it has to be shortened by 4.5mm if you use the Topfblende (Saukopf if you wish) in the kit. The easiest is to push the barrel deeper in.  The Topfblende had a very prominent gap between it and the fighting compartment. (how would it move otherwise ?) This is not the case in the kit, so a 2.5mm spacer has to be provided. To make it easier on myself, a (rarely seen) canvas cover was later added from putty.  According to  the Topfblende is too long, as it should not have any overhang with respect to the glacis; according to  it is correct.  Both  and  show that the front end of the driver's compartment (incl. added armor) should not overlap the glacis plate; in the kit it does.  The gunner's periscope is built from scratch, as is the hinge next to it.  The concrete deflector in front of the commander's copula was raised with putty and a hinge added to the small sub-hatch. 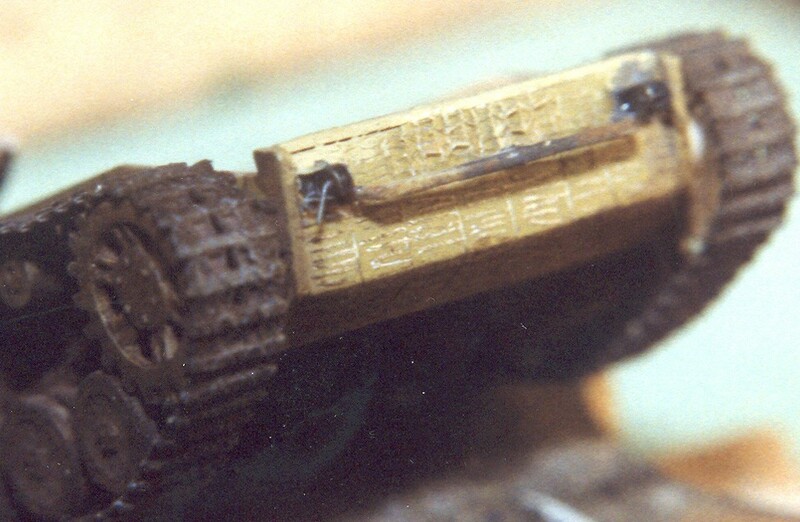  At the rear of the fighting compartment 2 antenna-bases were added (I wanted a command vehicle), and the cover plate for the ventilation unit.  The rack for the spare wheels comes from Eduard, but needs to be positioned farther to the rear than in the manual. One road-wheel and jerry-can (from Esci) were put into it, and a transversal bar (sprue) added.  The tools are moulded integrally with the fenders, but are not too bad. C-hooks from MR were added to the right fender, together with an aluminium strip to hold them in place. The fire extinguisher and jack came from the Esci kit.  On top of the glacis the attachments for spare tracks were added from the Extratech set, but the tracks themselves were not fitted.  On the driver's roof, you find a rail. Some vehicles had them (but apparently sloping the other way). I cut it away.  The driver's periscopes come from Extratech.  The Bosch headlight was replaced with a smaller one from Esci and an electrical wire added. Alternatively you could simply shorten the support to make its size less apparent. 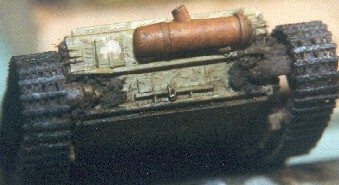  The bar to hold the spare tracks on the bow plate is missing. Again I raided the Esci kit.  On the rear plate there is a wooden jack block. I haven't found this in pictures, so I cut it away. Perhaps Matchbox got confused with the muffler of the auxiliary engine in the PzIV ?  The exhaust is not mentioned in the manual, but is in the kit. The supports, however are not.  The engine compartment is quite nice. The armoured shutters are moulded onto the fenders. I left them this way.  A small inspection hatch and two plates with a small pin (?) need to be added to the rear plate.  The rear (movable) fenders were detailed with an extra triangular plate at the inside and a spring from sprue.  A taillight and convoy light were added to the rear as well (scratch).  I did not place the Schürzen that Eduard provided, only their attachments. That, in itself, is not for the faint of heart, as they come into 3 pieces that have to be bent and glued to medical precision. I did not manage to fit the PE rail, so I recovered the part from Matchbox. The teeth were thinned down and a small peg added to the front. The small PE hooks were added to the fenders. These fenders were thinned down at their edges. If you really want, PE sets exist for them.  The tracks are hard plastic. Not too bad on the outside, but no detail on the inside. They were replaced with Part P72-068 Pz Kpfw IV Track (photo-etch).  The drive sprocket is 0.8mm too high, giving it a “Panther look”. Cut off and positioned lower.  The rearmost return roller should be positioned slightly lower.  The fuel filler caps need to be added to the left side of the hull. I took them from my derelict Esci PzIV. I only noticed it very late in the build. That's why picture 4 shows a nearly completed model, where I added the first cap.  Matchbox gives a drive wheel with 14 teeth (Esci 16 and the Revell kits 17) In reality there were 20. It took me a couple of hours to recrufy. I am not very happy with the result.  Behind the idler there should be a tow hook, which I duly forgot.  The fit between the lower hull and the superstructure is so-so.  The hatches are too thick and lack detail, but can be opened. Hatch handles from brass wire were added and some other detail from plastic sheet.  The decals are way out of register and don't even adhere to the surface. 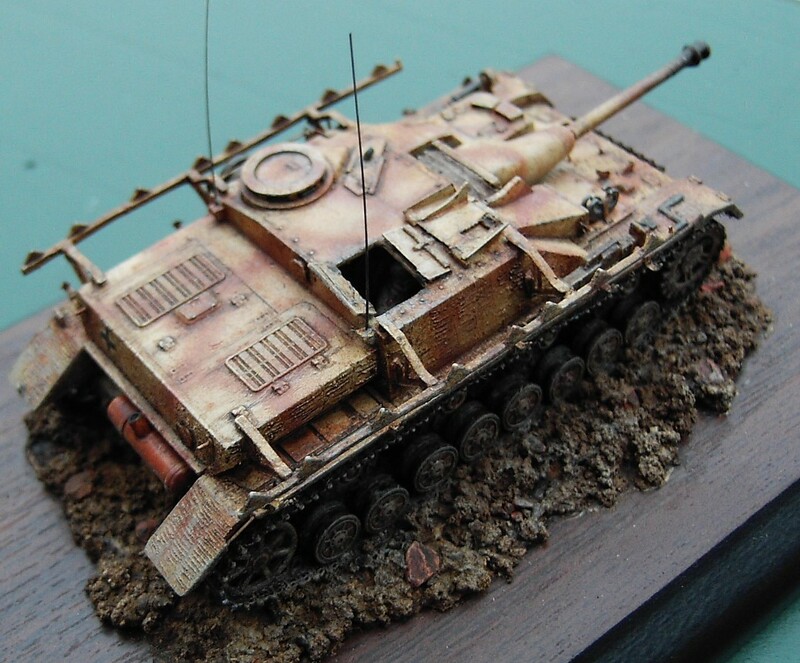  As almost all early StuG IV carried Zimmerit, I had no choice but to add it. Luckily the pattern for this vehicle is quite simple to engrave. Strangely enough a number of these points are correctly shown in the manual, which is quite clear. On the drawing based on the kit manual you see what was replaced, added or altered to the model. Well into the construction of this model, Modell Trans came out with their conversion set. This was not very encouraging for this project. Worse, while writing this article, Dragon released their kits, which caused a very loud “D'oh !”. These kits are not only better, but also a lot cheaper, looking at the cost of all the parts I added to this model and the psycho-therapist I had to pay afterwards. Still, my suffering was rewarded with a silver medal at the 2004 Belgian Nationals, showing that a resonable purse can be made out of this pig's ear. In summary, this kit is highly recommended for the masochistic modeller ! Note with respect to the picture of the finished model. As you can tell, the antennas are not very realistic, and they were changed to a slightly thicker length of stretched sprue after these pictures were taken. 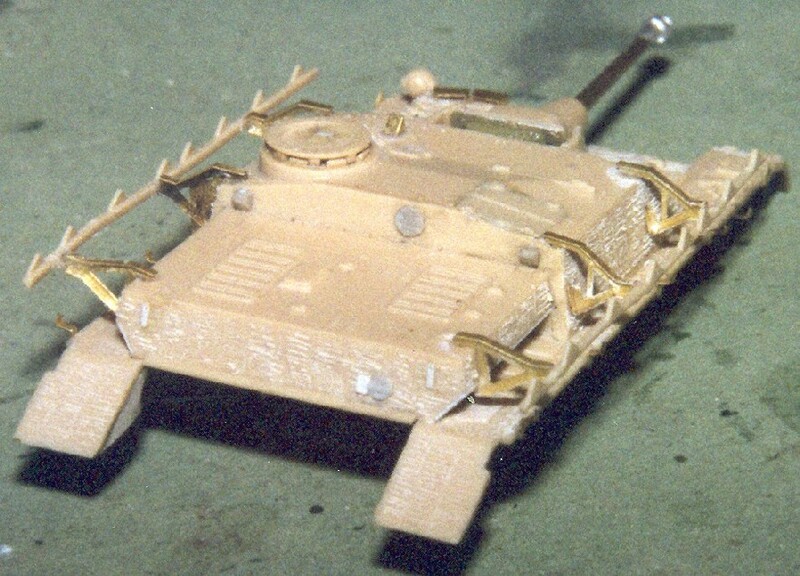 I have switched to clear styrene sprue for this (from aircraft kits, you don't find these often in AFV kits), as these tend to be more rigid, and do not bend over time. The good old piano wire will do as well of course. Myssing-Lynx website ( http://www.missing-lynx.com/ ).